Today, the ski market is crowded with offerings from traditional big ski corporations as well as a plethora of smaller boutique manufacturers who have sprung up over the past few years. In order for these smaller companies to thrive in their David and Goliath struggle they need to offer new and innovative designs and geometries to set themselves apart. This is exactly what Skilogik has done. 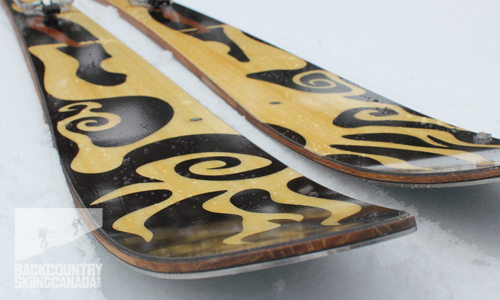 They have gone back to basics and amped it up a notch by offering an essentially wood ski. Sure there are lots of high tech materials sandwiched in there but the top sheet, sidewalls and most of the core are wood. To improve upon the traditional ski design Skilogik has used state of the art manufacturing techniques to create some of the most visually stunning skis on the market and so, beyond the functionality, this raises the question – do we store them in the basement or hang them on the wall? You either love or hate the look of the Skilogik top sheet designs (I don't understand how you couldn't love them personally). 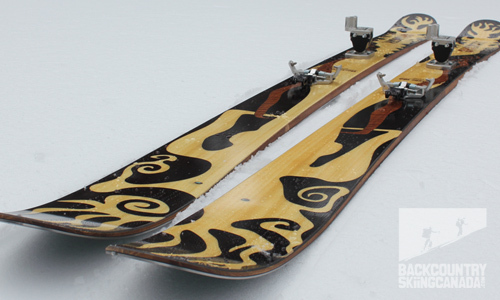 The non-traditional use of wood laminate top sheets and solid wood sidewall construction takes you back to the roots of ski design before all the fancy pants materials came on the scene. 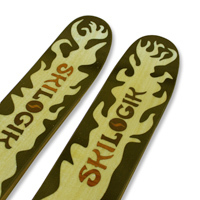 The top sheets are not screened graphics, instead they have a wood veneer artwork to give the Skilogik skis their unique appeal and appearance. The custom top sheet designs have a very tribal, spirited feel. They are all created by the founders wife - Mariella, who has an extensive artistic heritage and has developed her passion for ethnic art forms from living in several countries with diverse cultures. 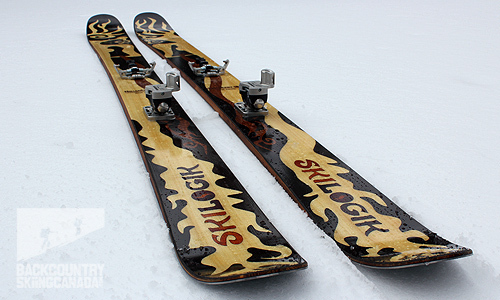 You can choose one of several top sheet designs for any of the Skilogik skis which makes it hard to tell what ski someone is riding but does keep things unique to your personality. We combined our Skilogik Howitzers with the relatively new Plum Guide tech bindings which keep things ultra light and looking good. The founder and visionary behind the Skilogik brand is David Mazzarella (or "Mazz" as he prefers). He cut his teeth with a company called Scotty Bob who was the original asymmetric tele ski manufacturer in the U.S.A. K2 eventually purchased this company and Mazz and Scotty Bob parted ways giving David the opportunity to build his own factory in China and build skis with care and artistry, not mass-production. 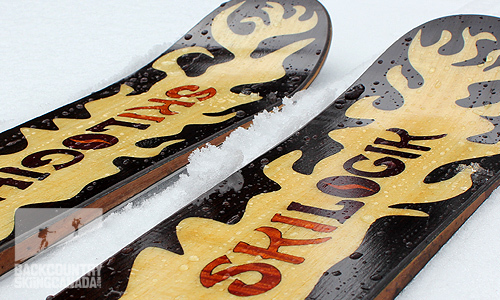 Ski logic produces roughly five pairs of skis a day and utilizes materials and labor hours in another country to enable them to hit their price point for their target market. If they didn't so this, the price of these skis would be well beyond the average joe. At the heart of their construction lies a paulownia hardwood core with carbon fibre, fibreglass and rubber dampening edge layering. Black locust sidewalls and a hand-made marquetry wood veneer top sheet complete the construction and create the 'piece de resistance'. A generous coating of 'clear iron finish' is applied to the top sheet for protection and so far seems to do it job well. Conventional wisdom would tell you that all this wood would rapidly age these skis with 'to be expected' knocks and dings from traditional use. However, apparently you can simply sand out any scratches and apply some Linseed oil to buff the finish back to beautiful - time will tell if this holds true. Thanks to the double layers of quadraxial carbon fibre and fibreglass structure the weight is kept right down for a ski of this size. You will notice this not only on the skin track but also on the down as these skis are super responsive. The howitzer provides a very stabile and responsive ride, the 22 meter side cut and underfoot camber makes for easy turning and they simply love Powder - this is where this ski really shines. 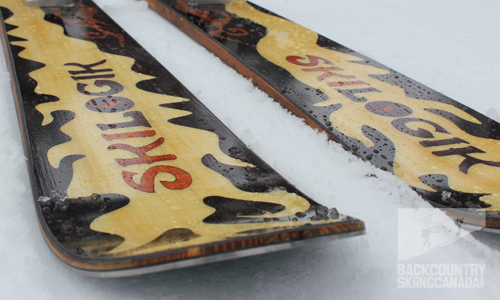 The Skilogik Howitzer is stiff enough to allow for stable tracking and big fast turns if this is your thing. You need not worry about being 'back seated' as the stiffness makes it easy to keep your balance and you can easily correct when needed. The early rise tip gives plenty of float in the powder but no love at all on hard pack groomers. Given that the Howitzer is a big ski this is not surprising, sure, you can still make some nice turns on the hard pack but it will take some effort. The Skilogik Howitzer is a very light ski relative to others of this girth on the market today, weighing in at only 8.5lbs. This weight makes for a very responsive ski which is easy to get on edge and turn in deep powder. At 110cm under foot these babies float like a dream and can man handle chop and adverse snow conditions with little effort. This light weight is also a huge help on the up track, your friends will think you are quite the machine given your ability to move such a monster ski so efficiently up the skin track. 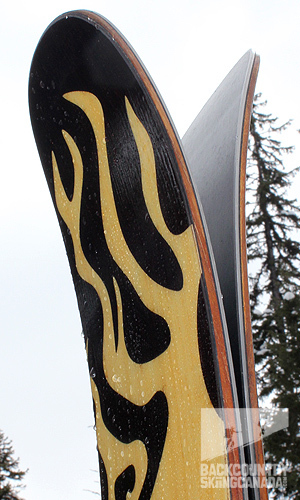 One aspect of the Skilogik Howitzer that is not ideal for the backcountry is the tail rise. This proves problematic to fluidly perform a kick turn on a steep up track and be able to bury one ski under the other. This is not to say that it can't be done in light powder but it does prove to be less then natural in the wrong snow conditions. The twin tip design is also not ideal for situations that require a quick boot pack up a steep section as the skis cannot be plunged into the snow and used for anchors as you climb. We should qualify all of this by saying that the Howitzer is not Skilogiks' answer to a backcountry ski, this is an all mountain ski that just happens to rock in the BC. Word is that Skilogik will answer this backcountry call next season when they release a new ski that is designed purely for ski touring bliss. (We will be sure to keep you in the 'know' on this front and hopefully review a pair as soon as they are available). We all know that ski manufacturing is not the most environmentally sound industry but Skilogik has put some thought into how to make their skis with the environment in mind and I can respect that. Given that Skilogik makes their skis in China you would natural have visions of cheap sweat shop labour. In fact, Skilogik follows responsible labor practices, pays all their workers above the market rate to attract and retain a quality team, provides generous benefits package where employees eat a hearty lunch together provided by the company. On the production side, 95% of the wood used to make Skilogik skis is sustainably harvested and for each pair of skis produced one tree is planted in the Atlantic Rainforest in Brazil by the Nature Conservancy. This is a step in the right direction and hopefully other manufacturers follow this lead. I have been searching for a backcountry ski that would shave some weight off my current AT set up but not compromise the down for the up. A ski that would be manufactured with integrity and thought. 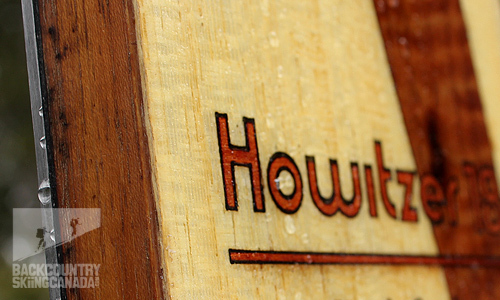 A ski that would consider the environment and use mostly natural wood products (ok, no one is perfect here). And finally a ski that would look back up at me and make me smile not just because of its narcissistic nature but because of its shredding prowess. This is what I have come to find in the Skilogik Howitzers. Have a look at the other Skilogik reviews we have prepared including the Skilogik Yeti Skis which were awarded our coveted Gear Of The Year Award, the Skilogik Piton Skis and the Skilogik Ullr’s Chariot BC Skis. Beautiful designed top sheet and sidewalls (art gallery beautiful), light and responsive backcountry powder ski, consciously manufactured. More challenging skiing on hard pack and groomers but a tip edge detune could remedy this.